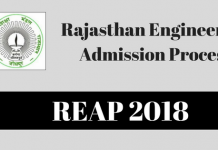 REAP Counselling 2019: Rajasthan Technical University, Kota will be responsible for organizing REAP Counselling 2019. Through this counselling process, seats and admission are offered to candidates. The university will conduct counselling from the first week of July, 2019 on the basis of JEE Main 2019 rank and Class 12th score of applicants. Applicants who meet the cut-off and get their names listed on the merit list are shortlisted and called to attend the Counselling of REAP 2019. Applicants have to register and fill their preferred choices of B.Tech branch and institute at the time of counselling. The admission authority will conduct three rounds of counselling plus a special round. This special round is generally known as Open round which is used to fill the vacant seats if left after completion of all the three rounds of REAP 2019 Counselling. Round 2 is conducted for applicants belonging to Rajasthan and who have Rajasthan Domicile. Aspirants who have not participated in any of the above-mentioned rounds can take part in the Open Round of REAP 2019 Counselling. For this round, separate registration and choice filling will be accepted by the University. Candidates have to pay a Registration Fee of Rs. 700 which will be non-refundable under any circumstance. Applicants are advised to keep the transaction number safe which will be generated at the time of payment. After the fee has been deposited, an aspirant has to fill their personal and educational details in the Registration Form along with valid email id and contact number. Now the candidate needs to submit the registration form after previewing each and every detail mentioned on it. On successful submission of the form, an applicant will receive log in details on their respective email id and phone number. Aspirants can now fill the choices of branch and college as per their preference and convenience. These choices must be filled in order of priority. After the choices have been filled by applicants they need to lock them. No correction will be accepted once the choices are locked. If candidates do not lock their choices, then the authority will automatically lock and submit the choices before the final date of submission. 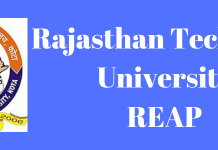 Rajasthan Technical University, Kota will then allot the seat to applicants depending upon the JEE Main 2019 rank, available seats, category and choices filled. Aspirants can view the allotted seat online by visiting the official website of REAP 2019. The admission authority will send the Seat Allotment Letter to the candidate on their email id. Candidates have to download this allotment letter and they must also take a printout of this letter for future admission process. Now the authority will provide date and time to applicants for reporting at the allotted college. Applicants must carry their original documents and seat allotment letter when reporting at the allotted college. A printout of Application Form with a passport size photograph affixed on the specified area. Applicants who have not participated in any of the three rounds of REAP 2019 Counselling are eligible to take part in the Special or Open round. The authority will accept new registration for this round. Also, candidates have to fill their preferred choices of branch and institutes. Applicants who belong to Rajasthan and outside Rajasthan are allowed to participate in this round of REAP Counselling 2019. 6 Candidates who have not participated in any of the main rounds of Counselling of REAP 2019 Rs. 700 as Registration fee in addition to Advance Admission fee of Rs 10,000. Rajasthan Domicile applicants who registered on the basis of 12th standard marks. Out of Rajasthan applicants with JEE Main 2019 rank. Out of Rajasthan applicants who have registered based on class 12th marks. Registration will be mandatory for REAP Counselling 2019. Only registered candidates will be allowed to take part in the counselling process. Candidates can register based on JEE Main 2019 rank and Class 12th score. JEE Main 2019 is given more preference. The counselling will be conducted online through a centralized system. Applicants must be physically present for verification of documents. The candidate cannot send any other individual on their behalf for attending REAP 2019 Counselling. Aspirants must report at the allotted venue for further counselling process on the specified date and time. Rajasthan Technical University, Kota will not organize separate counselling process for aspirants if they fail to attend it under any situation. If any candidate submits fake documents then he/she will be rejected from taking admission in the university.